Broadening your horizons seems the most natural thing to do, and if you’ve been meeting your obligations, then you’re likely to experience rewards for your efforts. Travel and educational pursuits add emphasis to your endeavors. Maintaining consistent energy is much easier, and you may feel inspired to set more challenging fitness goals. Team sports, a fitness class, or working out with a personal trainer can provide the perfect impetus for improved health. Your most intimate, loving relationship can become more intensely passionate. A special weekend during the Moon on October 9 inspires you to share your visions and hopes, and marks a wonderful time to strengthen your vows of love. Travel from October 1 to 16 can be a source of special moments. Home and family require more attention near the Moon on October 24, although you may feel like keeping some of your opinions to yourself. Attending business conferences, making presentations, dealing with courts, and legal matters are all excellent avenues for career endeavors through October 23. 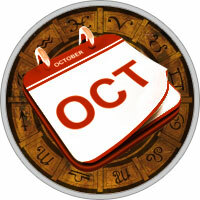 Deception or undermining can be problematic and you may also encounter unpleasant financial surprises from October 16 to 25. It’s a good idea to align yourself with influential supporters and to define your plans very carefully during the early part of the month. Your integrity shines brightly, lifting your confidence and inspiring the trust of others.